Many have tried and many have failed at facial recognition. In the last few years, interest in and promotion of this technology has waned, as seemingly little development has taken place in surveillance. Now, recent entrant NLSS has added on facial recognition to their VMS/access platform, promising tight integration and some novel functionality. In this note, we overview this new offering, its integration to the NLSS platform, and potential impact on the market. NLSS' facial recognition analytics are an add-on analytic, licensed per NLSS Gateway. 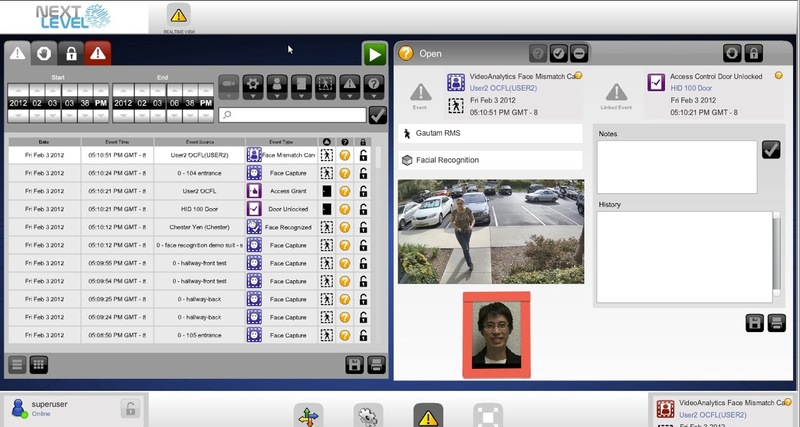 Facial recognition events are integrated as events in the system, displaying the event, captured face information, and associated video in a panel. In addition to matching against watchlists, it can be integrated with other events. This integration opens some interesting possibilities. For example, at access controlled doors with cameras, the user's face may be matched to the face on file when a card is presented. Upon mismatch, alarms may be generated, so security staff can be dispatched to question the individual. This may also for anti-tailgating purposes, as an alarm may be generated if multiple faces are detected, but only a single card read. Configurable sensitivity is available for higher/lower sensitivity and confidence, in order to adjust the analytics for differing scene sizes and applications, and manage false positives. Processing capacity varies by gateway model, though firm figures for throughput are not yet available, during pre-release. Availability and Pricing: NLSS' facial recognition is currently in pre-release, with general availability within the next few months. Unlike most of NLSS' analytics, facial recognition is an add-on license, not included in the gateway from the factory. Pricing is not yet final, but is expected to be a few hundred dollars per gateway. Channels Supported and Load: The total numbers of channels that can run facial recognition depend on a number of factors, including the size of the NLSS appliance being used. However, in general, users should expect to activate this on only a few channels of any given appliance. For technical details, check with NLSS on specific applications. NLSS has included a face capture analytic in the Gateway for some time, which simply created an event when a face was captured in video, without performing recognition against a database. Users may see our reviews of NLSS' positioning and access control offering for more general information. With this addition, NLSS becomes the first to release an integrated video surveillance/access control platform with facial recognition. Other products may be able to provide similar functionality, when used with third-party analytics, but offer a more complex solution, requiring more labor to integrate and potential challenges in integration. NLSS also likely reduces overall cost, as third-party analytics are typically more expensive, and require more complex integration, pushing costs into the thousands or tens of thousands of dollars. By contrast, the entire NLSS including VMS software, access control management and facial recognition is just a few thousand dollars. Facial recognition has historically suffered from poor performance, and is easily affected by multiple variables, including lighting variations, camera angles, changes in appearance, and other factors. Without testing NLSS' offering, we cannot give opinions on performance. However, if customer expectations of accuracy can be managed, it may present a novel addition to their security systems.